Ventura County Sheriff's Sgt. Ron Helus, a 29-year veteran, was killed during the deadly shooting at Borderline Bar and Grill in Thousand Oaks, Calif. Firefighters, law enforcement and members of the public watch Thursday as a motorcade escorts Sgt. Ron Helus' body to the Ventura County Medical Examiner's Office. Sgt. Ron Helus was on the phone with his wife when the reports of gunfire started streaming into the Ventura County Sheriff's Office. It was around 11:20 p.m. PT Wednesday, and a gunman had opened fire at the Borderline Bar & Grill. He told his wife he had to handle the call, told her he loved her and hung up the phone. Within minutes, together with a California Highway Patrol officer, he arrived at the hellish scene in sleepy Thousand Oaks, Calif.
That phone call would be the last words Helus said to his family. He later died of the wounds he sustained in a shootout with the gunman — one of 12 victims slain before the gunman apparently took his own life, finally bringing the bloodshed to an end. As wrenching as that toll is, it would have been still higher if not for Helus' "ultimate sacrifice," according to Ventura County Sheriff Geoff Dean. "There's no doubt that they saved lives by going in there and engaging with the suspect," a visibly emotional Dean told reporters assembled the morning after. "I've heard [there were] anywhere from 150 to 200 people in there. Not that by any means the loss of 13 lives is good, but it could have been much, much worse." The sheriff's office did not immediately release the names of the rest of the victims. A 29-year veteran of the force, Helus had been nearing retirement. At 54, the sergeant had served in several capacities on the force — including a years-long stint on a SWAT team, according to his colleague, Sgt. Eric Buschow. "Through it all, he's patient, compassionate, calm. I mean, that guy — nothing would get him fired up," Buschow told NPR's Eric Westervelt. "He could have someone yelling right in his face and just calm a situation down. He was cool. And I'm not at all surprised that he was the first one in the door." Helus also worked as a firearms instructor on the side. In a biography posted to the business' website, he explained that he had served as a firearms instructor for more than 25 years — both on the SWAT team and for the Ventura County Sheriff's Office as a whole. Helus and his wife also had an adult son, whom he'd been looking forward to spending more time with. "I imagine he was going to do a lot of adventures up in the mountains," Buschow said, choking up. Then the call came in late Wednesday night. 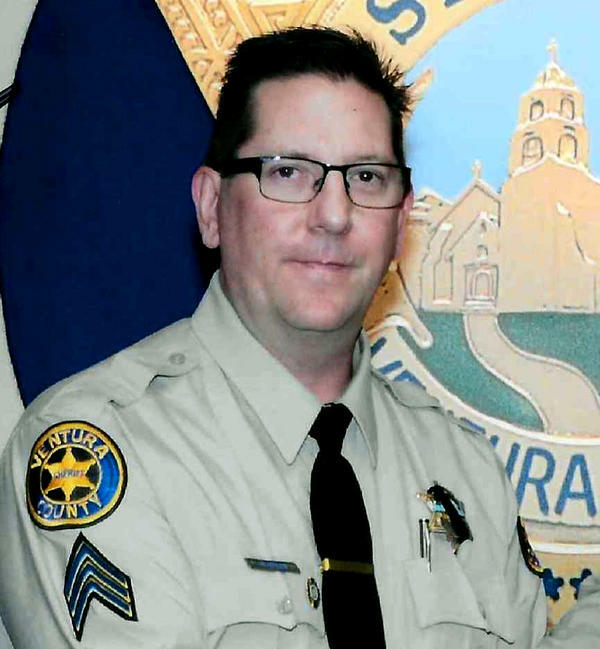 Helus and the highway patrol officer — whom Dean did not immediately identify — confronted the shooter within just minutes of the initial reports. During the shootout with the gunman, Helus was shot several times before the other officer managed to pull him from the line of fire, according to Dean. Helus was rushed to the hospital, but by the time he arrived, it was too late. The sergeant died there overnight. 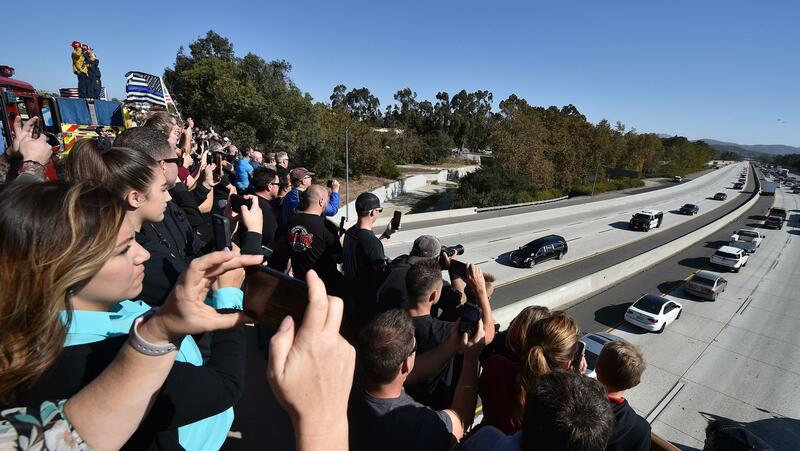 Police transported his body in a convoy procession Thursday from Los Robles Hospital to the Ventura County Medical Examiner's Office. The sheriff's office has "lost a hero," Dean said. "It's lost a great human being." But sadly, he added, that loss is just one part of a tragedy that has overwhelmed not just his department and not just the families of of the other 11 victims, but the community as a whole. "It's all part of the suffering that we're all going to go through — as family members and parents and brothers and sisters — on this tragic, senseless loss of life."